Gas will barely be part of the US economy pretty soon. Already, Americans are spending a smaller percentage of their incomes on gas today than they were back in 2008, down to 3.2% from a high of over 4%. That number is expected to drop even lower. 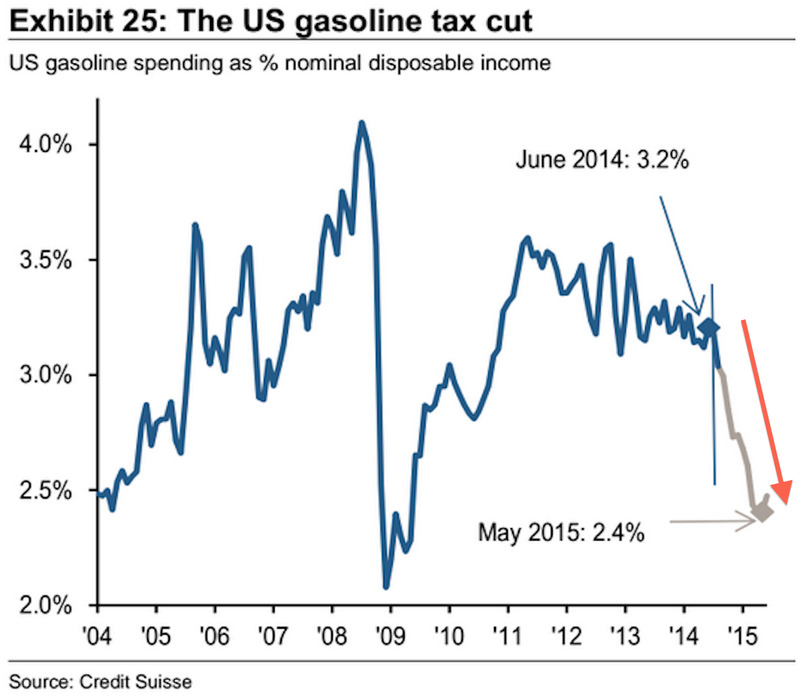 Americans are projected to spend only 2.4% of their nominal disposable income on gas in six months, according to a Credit Suisse Research report. There are two main trends contributing to gas’ demise. First, over the last few months oil prices have plummeted. Last week, WTI crude broke $US75 per barrel for the first time since 2011. Dropping oil prices have primarily been attributed to supply shocks from the US shale boom. Second, driving habits have changed. Americans are increasingly driving less, and cars are becoming more fuel efficient. Due to advancements in car manufacturing, cars are now 80% more fuel efficient and 60% more powerful, even when they weigh as much as they did in the 1970s. All of these changes are effectively creating a tax cut for US consumers. 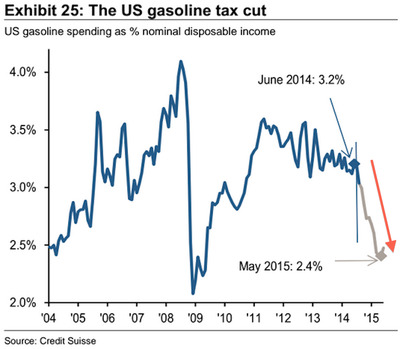 Now that they’re spending less on gas, they will have “extra money” to spend on other goods. “If the price is falling, it’s a tax cut in that you don’t have to pay for other things. If you are on a fixed income or a student or a lower wage worker, that’s money in your pocket,” said Deutsche Bank’s chief US economist Joe LaVorgna.